Characteristics of Excellence in Undergraduate Research (COEUR) is based on the collective experience, over many years, of CUR members who have engaged undergraduate students in research, developed undergraduate research programs, mentored new faculty to include undergraduate research in their teaching repertoire, and coached universities in the development of undergraduate research programs. Roger Rowlett, Linda Blockus, and Susan Larson have drawn on this extensive knowledge base to design an instrument to assist institutions to self- assess the maturity of their undergraduate research programs. The instrument aspires to present the best practices in undergraduate research. ...designed to share successful practices that enable faculty and institutions to design, implement, and sustain a research-supportive curriculum. The volume focuses on three broad areas: curricular elements and teaching and learning strategies that develop critical research skills, curricular infrastructure that enhances a research-supportive curriculum, and administrative contributions that initiate and sustain a research-supportive curriculum. Authors across disciplines and from a variety of types of institutions have contributed over 30 chapters and 50 "highlights" describing curricular approaches, methods and techniques developed for their courses and programs of study to enhance the research experience of stude3nts and the research culture of their institutions. Engaging undergraduate students in research, scholarship, and creative activity is a proven and powerful practice for enhancing educational outcomes and expanding frontiers of knowledge. This book is a rich collection featuring institutions that are maximizing the impact of this practice. Science in Solution shifts the science education focus from alarms about the shortage of STEM workers to the professional and personal benefits of undergraduates engaging in research. The shift suggests that undergraduate research may be a generator of scientists from across diverse groups of students. Personal development is the deep outcome of a research experience from which career choices grow. These undergraduate research experiences benefit students across the science disciplines, having characteristic features that enable success. These features include good mentoring, student input, working in teams, optimal structuring and opportunities for communication. 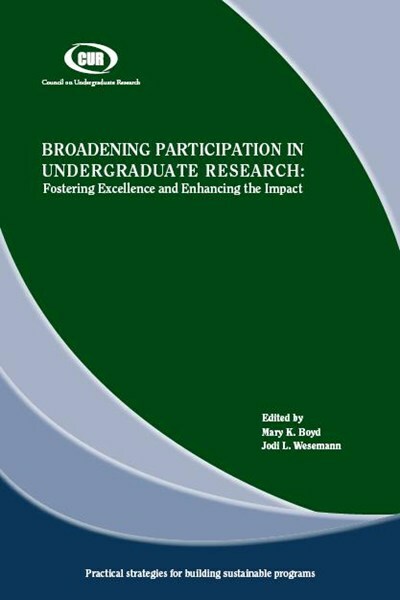 Research presented in the book documents the connection of these features to the benefits of undergraduate research. How to Mentor Undergraduate Researchers is written for faculty members and other researchers who mentor undergraduates. It provides a concise description of the mentoring process, including the opportunities and rewards that a mentoring experience provides to both students and mentors. This booklet provides useful information on beginning a research program and finding support for the program from both administrators and funding agencies. Appendices give advice on writing grant proposals and hosting poster sessions. A list of funding sources for faculty at PUIs is included.